I know this thread has veered off topic, but I am becoming more and more convinced every day that certain "officials" have been feeding the media deliberate disinformation. For me the biggest piece of obvious disinfo is the "mother worked as a teacher at the school" meme. It established motive at the beginning and was only cleared up days later. But enough confusion was sewn into this story that if you hadn't really been paying that close attention, you may still think Lanza was a teacher. This was on Nov 27.......wanna know what was also said? "The community needs to show a little more outrage on these things and demand that it be a top priority," Pinciaro said. "That will be more useful than another law right now." This was said by Ron Pinciaro, executive director of Connecticut Against Gun Violence just 17 days before Sandy hook. A critical component of the Project Longevity strategy is the “call-in,” a face-to-face meeting where partners engage group members and deliver certain key messages. First, that group members are part of a community, that gun violence is unacceptable and that the community needs it to end. Second, that help is available to all who will accept it in order to transition out of the gang lifestyle, and that social service providers are standing by to assist with educational, employment, housing, medical, mental health and other needs. Third, that any future violence will be met with clear and certain consequences. The next time a homicide is traced to any member of a violent group, all members of that group will receive increased and comprehensive law enforcement attention to any and all crimes any of its members are committing. The next time a homicide is traced to any member of a violent group, all members of that group will receive increased and comprehensive law enforcement attention to any and all crimes any of its members are committing. He had a large 10-12 round clip in the Saiga. Thats what you see and think is the second weapon. A large magazine for the Saiga can be almost as long as the gun itsself. Thats why I prefer drum mags. The down side beeing they wont accept a 3" shell. At first we saw an officer remove the Mag and clear the weapon. Next we saw two in white carry away the gun and magazine. Maybe but it looks to me like their hands are around the barrels of rifles and what is he playing with after he clears the shotgun? That is not a magazine he is playing with then sticks in the side of the trunk IMO. Donkey_Dean thanks for sharing your firearm knowledge. I've seen the Saiga 12 in MANY articles and Izhmash marketing materials classified as a "semi-automatic smoothbore shotgun". 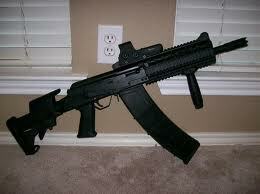 Would you agree that the Saiga-12 is a semi-automatic? Also, in your opinion, why would the CT State Police go out of there way to mislead the public by calling a Saiga-12 a Canta-12??? Seriously people, how hard is it to grasp? The Government staged the event to come after your guns. Stop being so damn naive. Only thing is in the longer video things don't match up. I need the HD of that longer one.